How many times can we print this headline we wonder before people start to take note that this really should not be happening. And even if there were a genuine cause for these explosions and fatalities, much more attention should be being given to them with high-profile media coverage and investigations, and yet what we see is increasingly muted media coverage, endless hushing up stories with ever more tenuous links to terrorism and no acknowledgement that aircraft really do not and cannot repeatedly explode in mid flight. Daallo Airlines Flight 159 (DAO 159/D3 159) was a scheduled international passenger flight operated by Somali-owned Daallo Airlines. 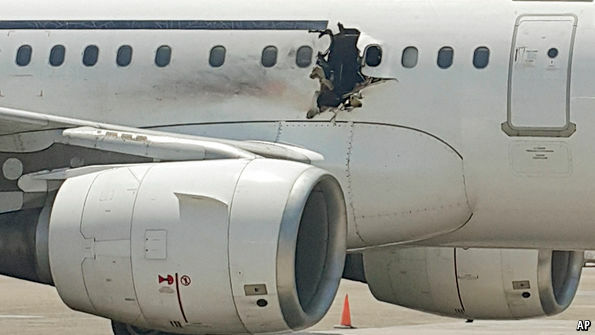 On 2 February 2016, an explosion occurred on board the aircraft 20 minutes after it took off from Mogadishu. The aircraft was able to return to the airport safely, with one fatality being reported. A subsequent investigation indicated that the explosion was caused by a bomb, possibly as the result of a suicide attack. The Islamist militant group Al-Shabaab later claimed responsibility for the bombing. 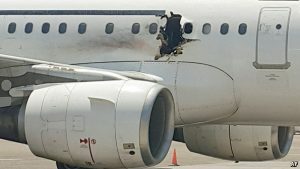 The aircraft involved was a 19-year-old Airbus A321-111, SX-BHS, owned by Hermes Airlines, and operated by Daallo Airlines at the time of the incident. Also telling is the fact that these incidence are now becoming so commonplace that almost no action is taken at the departure or destination airports. Don’t worry. Nothing to see here. It’s just those pesky terrorists again. Move along. This was particularly evident at the recent Istanbul incident, where the on-board explosion was blamed on a terrorist mortar attack, and yet no video evidence was ever retrieved, the airport returned to normal operations in 2 hours, and nothing was ever heard about the incident again. There are several things that highlight the fact that none of these incidents are caused by explosive devices. Passenger luggage is no longer loaded into the front cargo hold and yet all of these incidents have featured damage to one side or the other of the front cargo hold. The damage is not indicative of a bomb. Explosive devices, with the exception of very specialised directional explosive devices used by the military, explode in a certain way and result in an omnidirectional pressure. This would damage the fuselage of any commercial passenger jet over a wider area. It would also probably cause fire and explosive damage to passenger luggage, none of which have been reported. What we have seen is very direction damage, sometime with holes so small they could only have been caused by high-velocity projectiles from inside the hold puncturing the outer shell. This is not indicative of explosive devices. In this particular case it is also notable that the interior of the aircraft is almost undamaged, even in the immediate area of the hole in the fuselage. This is impossible if the cause was an explosive device located within the cabin as claimed by mainstream media. If we look at the epicenter of the hole, it is directly in line with one of the seats. Where could the laptop have been that media claim was the bomb? The explosive damage also seems to have originated from below the seating or even below the cabin, with projectile damage seeming to point upward rather than just outward. Again this dis no consistent with a device being inside the cabin. Most of these points are clearly visible in this film. 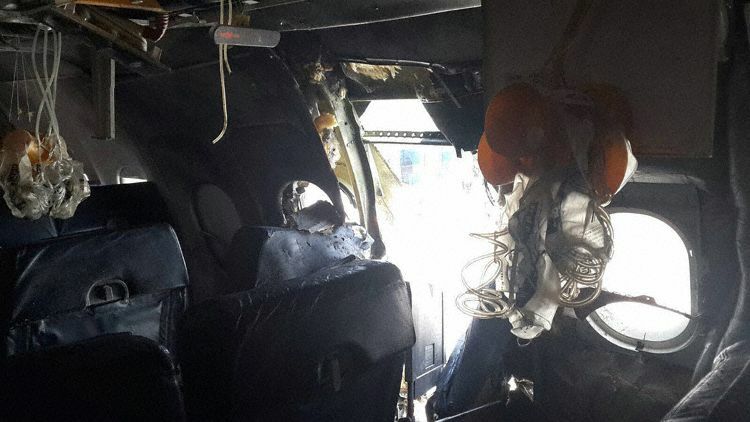 Interestingly the film also claims that an aviation expert re-iterates our claim that an explosive device in the cabin would have caused a lot more damage internally, and yet there is almost no damage to be seen. Ignore the main image and headline, we do not think the image os of the stricken aircraft as the flames are on the opposite side. Leaving aside technical analysis and just looking at this from a common sense perspective, who would blow themselves up with a tiny laptop bomb? The only fatality was the unfortunate man sat in the seat next to the hole. He apparently was set on fire and then sucked from the plane. Passengers reported no suspicious action by this man prior to the explosion. It simply makes no sense and stinks of yet another cover up. If, however we look at this through the lens of an explosion of the pressurised systems in the front cargo hold, then this all makes perfect sense. The containers that are now exploding in increasing frequency are located in the mid section of the aircraft, and are loaded in the front hold. Airbus typically have 3 of these containers loaded onto them prior to flight as was witnessed by us in Istanbul in 2014. ALL of the similar incidents we have reported on and attributed to explosion in these systems have features puncture damage in this area or slightly further forward, which would match perfectly the positions of the 3 containers. Terrorist groups have never claimed responsibility immediately, which would be the obvious pattern. Egypt still denies that the Metrojet incident was related in any way to terrorism. That is primarily as no evidence to suggest terrorism exists, and yet the mainstream media re repeatedly reporting this as a terrorist incident without attempting to provide any evidence or reasoning for their stance. That in itself is a big clue as to what is going on. Is the world asleep we wonder. Have we accepted that aircraft are now likely to suffer inexplicable mid-air explosions which could, and often do, lead to near fatal or fatal accidents, and in some cases total loss of the aircraft and all crew and passengers. Have we given up on common sense and the need to know and understand what is going on with the aviation industry workhorse aircraft. Bombs are almost impossible to sneak onto aircraft anymore. Virtually every airport int e world has very sophisticated screening systems and searches in place to protect us from such events, so how come these supposed terrorists are amangin to bypass these security checks with such ease and so regularly? On March 19th Flydubai Flight 981, a Boeing 737-800 crashed after a fly past in Russia. Official sources stated that high-winds caused the plane to crash. The official explanation is plausible, but suspicion arises because the 737-800 is the other work-horse of the CE world along with the Airbus A320 family. The fact that it was never properly explained and no report has yet been released seems to imply this may well be yet another suspicious incident that is being covered up. For the official story of all major airline incidents see the Wikipedia pages listed below, but consider the fact that the official version is rarely what really happened. We have yet to analyse pre-2010 incidents, but are sure that if we were to, we would find yet more similarities, inconsistencies and covert ups. The potential loss of life due to illegal and covert Climate Engineering directly causing fatal aviation accidents could run into the thousands.